If you have facilitated in a conference/workshop before, you might have created slideshow one or two times. Slideshows can be very useful resources for readers, especially if they did not have the opportunity to attend the conference/workshop. Making the slides available so that people have can remix the slides to adapt it for their own institution/school. Making the slide as part of the additional resource. Usually slides contain a lot of useful information such as diagram, picture and description. Making the full deck and presenter note available for other facilitators. If you were using complex animation/effects in powerpoint, this may be more appropriate method. On desktop browsers, powerpoint file will be downloaded to desktop instead of opening up directly as a slide. 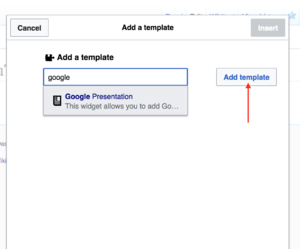 This is an example of embedding Google Presentation. Readers can read the slide directly from the page, and they can easily get an embed code. 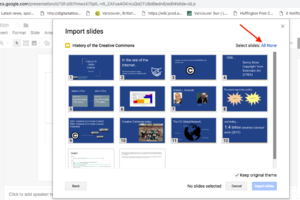 If you have already created a slide directly on Google Slide, you can skip step 1-4. Select File>Import Slides to upload your slides. Beside select slides, click on All to import all of your slides. After you have selected, press Import Slides. All of the slides are imported. Make necessary adjustment. 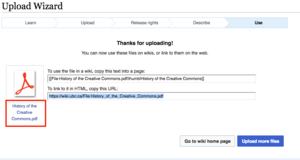 See the Powerpoint slide - History of the Creative Commons. 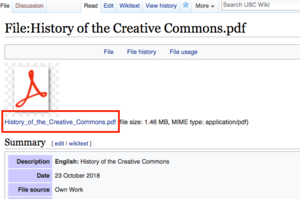 When you click on the link that says "History of the Creative Commons" it will open up a pdf page on the same window. Save Powerpoint presentations as a PDF File in Microsoft Powerpoint to learn how to convert powerpoint into PDF file. 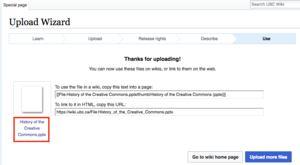 Go to Special:UploadWizard to upload the PDF file that you have just created. When you're at the end of Upload Wizard (i.e.the screen that says "Thanks for uploading") Click on the file name below the PDF image to go to the file page. You are at the file page. Right click on the file name under the PDF right click on the file name under the PDF file image and copy the link to the PDF . Go back to your wiki page. Insert a link using the link button ( ) . You're done! Now you have created a link to a powerpoint pdf. Go to Special:UploadWizard to upload the powerpoint file. When you're at the end of Upload Wizard (i.e.the screen that says "Thanks for uploading") Click on the file name to go to the file page. You are at the file page. 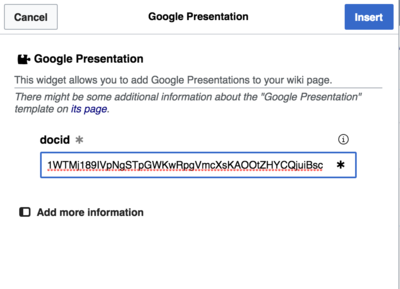 right click on the file name and copy the link to the [powerpoint . You're done! Now you have created a link to a powerpoint slide.